TAMPA, Fla. (AP) — Yankees right-hander Masahiro Tanaka got along just fine with baseball's new 20-second pitch clock in his first spring training start. TAMPA, Fla. (AP) — Masahiro Tanaka, among the most unhurried starters in the major leagues, does not support a 20-second pitch clock. RALEIGH, N.C. (AP) — Top North Carolina elected officials, party activists and a presidential candidate are among the speakers at an annual convention for college Democrats. RALEIGH, N.C. (AP) — Two congressmen say a Mexican immigrant who had sought refuge in a North Carolina church has been rejected in a formal request to stay in the U.S. to support his family. U.S. Reps. G.K. Butterfield and David Price announced late Monday that Samuel Oliver-Bruno's petition for deferred deportation was denied. RALEIGH, N.C. (AP) — A Mexican immigrant who took refuge in a North Carolina church for 11 months won't be deported until immigration officials decide his pending request to stay in the U.S., two congressmen said Monday. DURHAM, N.C. (AP) — Two North Carolina congressmen are slamming the Trump administration as "callous" and "cruel" after an immigrant who sought refuge from deportation in a church was arrested after arriving at an appointment with immigration officials. NEW YORK (AP) — David Price has won the Babe Ruth award as postseason MVP in voting by the New York chapter of the Baseball Writers' Association of America. After pitching the Boston Red Sox to their World Series title, Price will be honored along with other award winners at the chapter's 96th annual dinner on Jan. 26 in Manhattan. Half the 44 runs scored by the champion Boston Red Sox and Los Angeles Dodgers came across the plate on home runs. That's the second-highest percentage in baseball history, according to the Elias Sports Bureau, behind only last year's 57.4 percent. Steve Pearce hit a tying homer in the eighth and a three-run double in the ninth, and the Boston Red Sox rallied from a four-run deficit in the seventh inning for a 9-6 win over the Los Angeles Dodgers on Saturday night and a 3-1 World Series lead. Joc Pederson will return to the top of the Dodgers' batting order in Game 3 as manager Dave Roberts restores some left-handed pop to what had been a one-sided lineup. David Price pitched six innings of three-hit ball, and major league RBI leader J.D. Martinez broke a fifth-inning tie in another two-out rally that led the Boston Red Sox to a 4-2 victory over the Los Angeles Dodgers for a 2-0 lead in the World Series. BOSTON (AP) — Hyun-Jin Ryu is used to pitching in big moments and on big stages. Four years before being signed by the Los Angeles Dodgers in 2012, the South Korean left-hander was on the mound for his home country when it defeated Cuba in the gold medal game of the 2008 Summer Olympics in China. BOSTON (AP) — Boston ace Chris Sale will start Tuesday's World Series opener and David Price probably will follow in Game 2, Boston manager Alex Cora says. HOUSTON (AP) — Boston Red Sox ace Chris Sale was still feeling weak Wednesday and won't start Game 5 of the AL Championship Series. Alex Cora spent this season rewarding the support of Jackie Bradley Jr., David Price and the rest of the Boston Red Sox organization with a record-breaking year and a run deep into the playoffs. The rookie manager's accomplishments go further than the baseball diamond, too. Having seen his homeland of Puerto Rico devastated by Hurricane Maria, Cora remains at the forefront of helping the island rebuild. The Red Sox send David Price to the mound for Game 2 of their AL Championship Series against Houston hoping for a bounce-back performance from the entire club. Price hasn't pitched since allowing three runs in 1 2/3 innings in a Game 2 Division Series loss to the Yankees. That dropped him to 0-9 in 10 career postseason starts, the longest such skid in major league playoff history. BOSTON (AP) — Red Sox manager Alex Cora is sticking with David Price, saying Wednesday the left-hander will start Game 2 of the AL Championship Series against Houston despite an unprecedented history of playoff struggles. BOSTON (AP) — David Price flopped again in the postseason. And against the Yankees. Price lasted just 1 2/3 innings in Boston's 6-2 AL Division Series loss on Saturday night, giving up three runs and three hits, including home runs to Aaron Judge and Gary Sanchez that cleared the Green Monster. BOSTON (AP) — Luis Severino will start Game 3 of the AL Division Series for the New York Yankees and CC Sabathia will start Game 4 against the Red Sox if necessary. Boone announced the rotation before the series opener on Friday night. J.A. Happ was scheduled to face Chris Sale in Game 1, with Masahiro Tanaka starting Game 2 for New York against David Price. 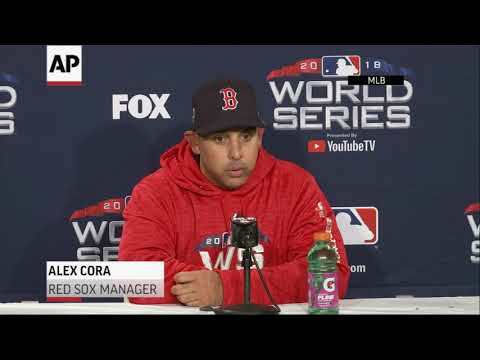 BOSTON (AP) — Alex Cora knows first-hand the way things change in October. That's why the Boston Red Sox manager wants to keep everything the same for his club. Routine served Boston well during the regular season. Under their rookie skipper, the Red Sox posted a franchise-best 108 wins and secured home-field advantage throughout the playoffs.